So...in spite of Chris and I's first failed attempt at dog ownership (see Sunday, February 8, 2009), we're on the search for a pup. Your mission is to help us. 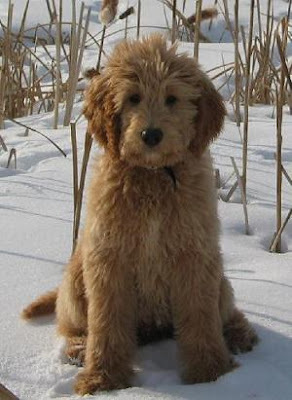 We know we want either a golden retriever or a goldendoodle. In addition to being a loved member of the Wehkamp family, this dog has to be able to go to schools and libraries and sit still while children read to it. I am a huge fan of Library Dogs and have high hopes of making my own contribution of time and support with our future furry friend. This will be a 100% therapy dog. One that can be taken to hospitals, retirement homes, even to court with young children who are scared or shy. I hear the downside to goldens is they shed a lot, and the downside to goldendoodles is they are hard to groom. But really, how can there be a downside to either of these adorable guys? I want to jump through the computer and hang out with them. We need a loveable, well-mannered, intelligent, dog that is patient and easy with children. 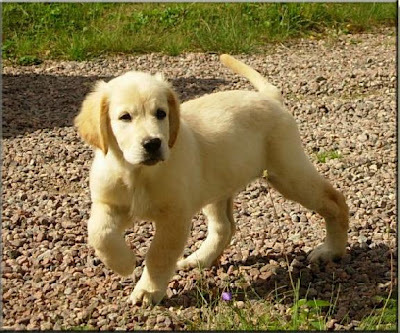 And one that they don't immediately shrink away from just after looking at it, even if it is the nicest dog in the world. If there's a breed we missed and should look at please let us know. Thanks for your help helping us find a helpful dog that can eventually help others that need help. No I don't have a picture of us training. And I'm not really sure what this picture proves except that I have running attire. You'll just have to trust that I use it. Our reasons for not writing, I've decided, are three-fold. #1 We both work for the state now and anything we say can and will be used against us in a court of law. #2 A new country, a new apartment, a new car, two new jobs, being around friends and family again = little to no time to write. #3 We're not flitting about in France anymore or meeting magical ferries in Greece - we work, go to Target and watch HGTV. Trying to make that interesting, or even reporting on it at all, is a challenge. And to tell the funny, ironic truths about work and going to Target, leads us back to #1 and the possible expulsion from our current places of work. Well, for today, I'm going to go way back in time and touch on a tiny part of our European adventure that never got properly blogged about. Summer tobogganing is actually one of my favorite pastimes. It's something I wish I could build in Texas because I know Texans old and young would love it too. You start at the top of a scenic Swiss mountain, then hop on a metal tobaggan and away you go. My parents definitely got a kick out of it. Chris and I had a blast. We flew down the mountain at break-neck speeds and giggled the entire time. A very successful last day. After coming off the mountain we had some dinner in town, crossed the lovely bridges, and made our way into a candy store. All in all, a great last day in Europe. We woke at 5 a.m. the next morning to catch our flight home and the rest is history. As I look through the pictures today I realize there's a lot that you haven't seen. I'll try to par them back and add some never before seen footage soon. Maybe a director's commentary, some bonus features.